Weyt-kp xwexweytep (hello everyone). The Simpcw people speak the western dialect of Secwepemctsin (the language of the Secwepemc or Shuswap people) which has been passed down from generation to generation. Secwepemctsin is in the Interior Salish language family. It is through the language that the Simpcw are tied so closely to the land and each other. Communities were united by their common language and their shared values based on resource gathering and the maintenance of communal ties. 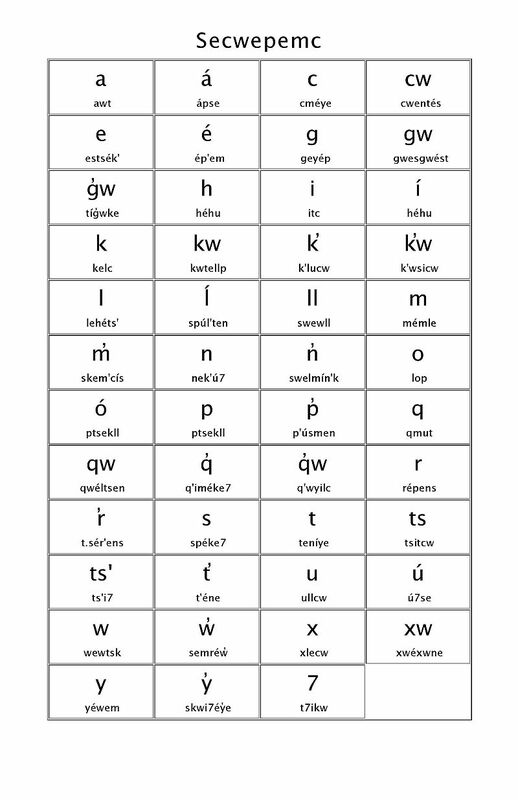 The borrowed English alphabet was used to develop the Secwepemctsin alphabet, which consists of 43 letters. Note that the pronunciation of those letters is phonetically different than the English verbalisation. The Secwepemc language is one of Canada’s endangered First Nation’s languages and is in jeopardy of being lost due to the loss of Elders and the residential schooling systems of the mid-1900s; however, the Simpcw people have been working to revive the language through various methods and programs. Neqweyqwelsten School incorporates language and culture into their everyday learning; A Secwepemctsin class is taught five days a week, where the students learn various topics such as: family, weather/calendar, animals, stories, prayers, and traditional hand drum songs. The teachers and staff also work hard to utilize basic commands in the classroom. Additionally, a Cultural and Language Coordinator was hired in June 2011, who is responsible for planning and delivering cultural and language activities for the Simpcw community. A resource library is in the making so that there are readily available teaching materials for on and off reserve Simpcw people. Some examples of the efforts to maintain this traditional knowledge are: stories told by our Elders, handouts and booklets for different categories (family, clothing, colours, etc. ), Simpcw territory maps and place names, CDs of Secwepemc children’s songs, stick game/hand drum songs, as well as audio recordings of words and phrases.